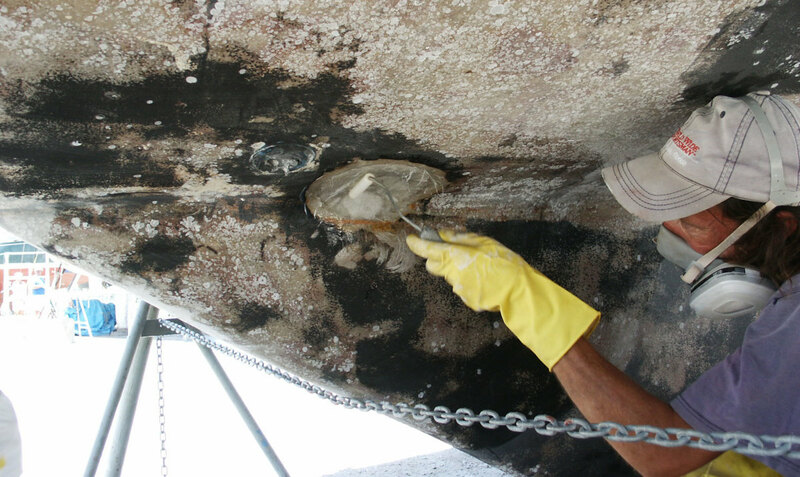 When a boat’s systems or interior are modified, you may need or want to glass over existing holes in the hull. 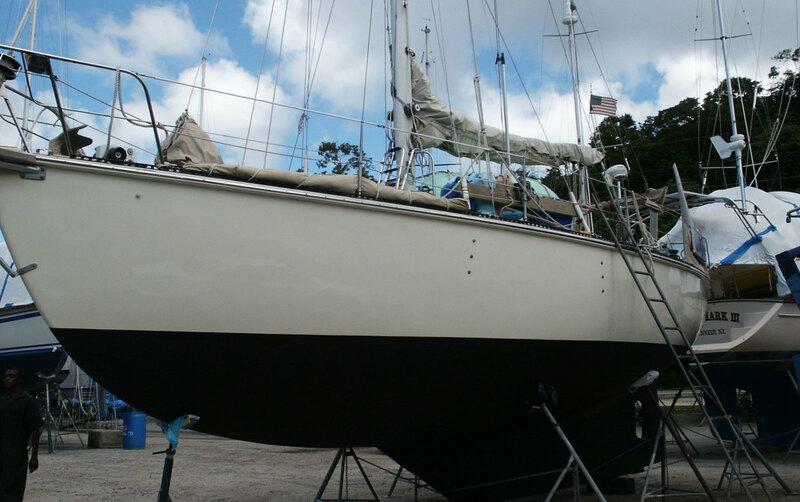 One season when we hauled out in Trinidad, we decided to eliminate three through-hulls in our Creekmore 34, Eurisko. The holes were all different sizes, but we treated this as one project, performing each step on all three holes before continuing. In this way we used fewer materials and saved time and money. We had already removed the plumbing from each seacock. Next we unscrewed the through-hull fittings from outside the hull, which proved to be no easy task. Lacking a through-hull wrench, my husband, Dave, used screwdrivers for leverage and finally managed to unscrew the bronze fittings without damaging them, causing only minimal damage to his knuckles in the process. Next he took out the seacock bolts. We had installed these using 3M’s 5200 adhesive sealant, so they had to be forcibly removed. With the hardware out, we measured the thickness of the hull at each hole, which varied from 1in to 1¼in. Around each hole Dave drew a circle with a diameter eight times that of the hull thickness at each location. One circle ran on to the keel and was lopsided. 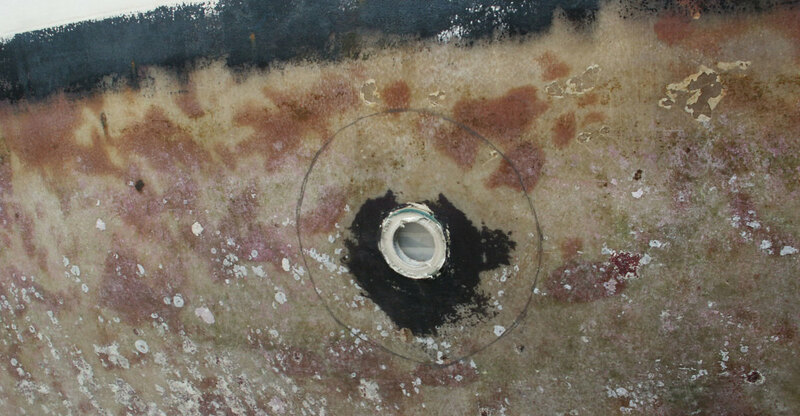 Ideally, we would have marked similar circles on the inside of the hull as well, so as to create hourglass-shaped laminate patches for each hole, but we were living on the boat and this was not feasible. Next we pulled off the tape on the inside of the holes, cleaned up the dust that had crept through and taped them back shut. 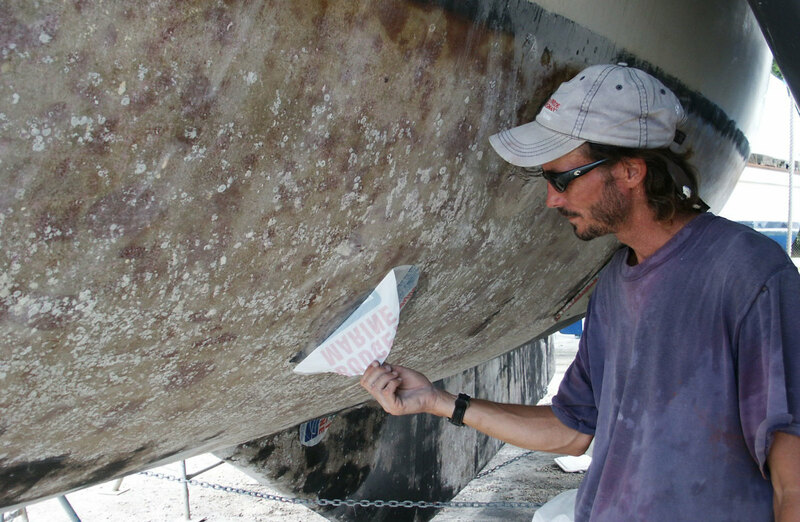 Dave once again washed the areas around the holes outside the hull with acetone, and the boat was ready for epoxy. We elected to patch our holes with chopped strand mat and 12oz biaxial cloth, because that’s what was available. Depending on your hull laminate, you may or may not need to be more particular about the fiberglass fabric you use to create your patches. Using a compass and a Sharpie pen, Dave drew out a series of 16 circles on our glass fabric—eight on the mat and eight on the cloth—for each of our holes. Each series started with a circle a quarter-inch smaller than the ones drawn on the boat, followed by smaller-diamieter patches that decreased in size by half-inch increments. In order to work quickly and neatly, we decided I would mix epoxy and Dave would apply it. 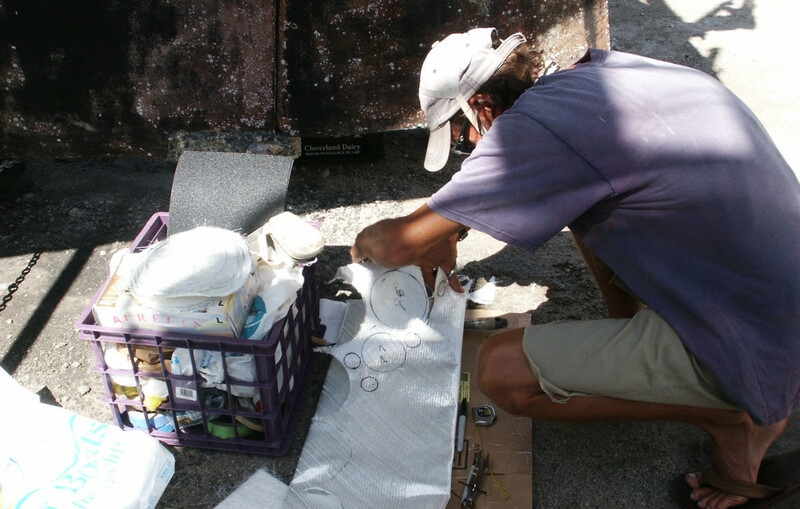 Using epoxy in Trinidad in the summer is a race, because the heat causes it to set quickly. Once we mixed it, even though we kept it in the shade, we had to work as quickly as possible, completing the work in one area and then moving immediately to the next. 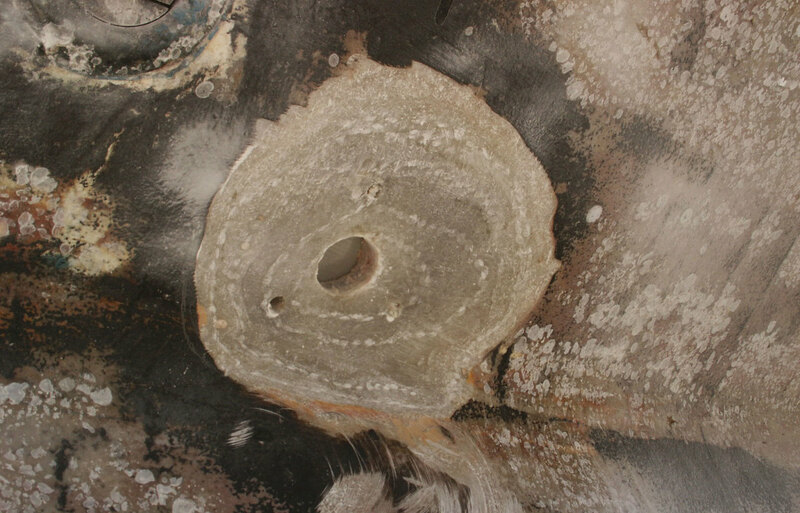 Dave first used neat epoxy—straight, with no fillers—to wet out the area around a hole. After that he lightly troweled colloidal silica and epoxy, thickened to mayonnaise consistency, over the entire area. 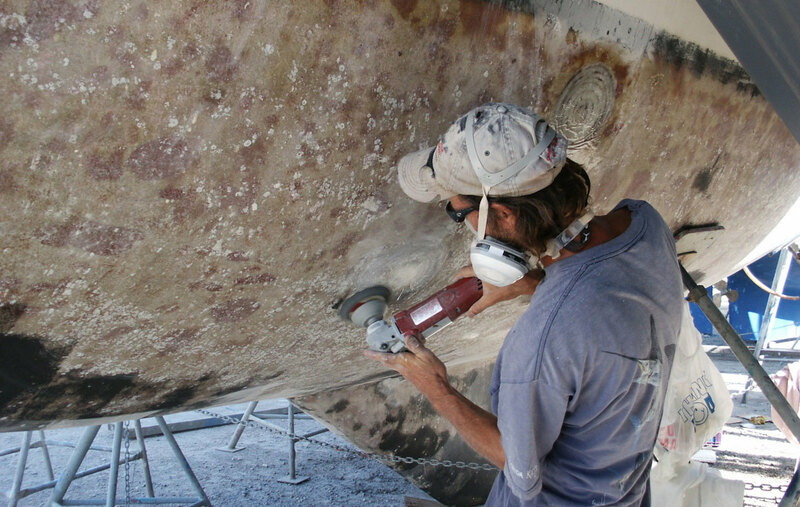 Then he wet out each circle with neat epoxy before applying it to the hull. The largest mat circle went down first, followed by the equivalent size cloth circle, and so on, alternating layers of mat and cloth. The mat builds bulk in the laminate, while the cloth provides structural strength. Dave continued wetting smaller circles of fabric, and applied them one at a time. Between layers he used a roller to squeeze out any air pockets that might have formed. We found it was necessary to leave out a few circles of fabric on some holes so as to create a flush surface. Once all the layers were down, Dave applied more silica-thickened epoxy to smooth out the area. Next he placed a layer of “peel-ply” plastic over the patch to keep it from sagging and to ensure the surface would be fair once it cured. Any polyethylene plastic will work for this; we used a Budget Marine shopping bag. Dave then squeegeed out the patch to fair it with the hull and cut away the edges of the peel-ply so that it would not pull it away from the hull. As epoxy cures it generates a lot of heat, which causes the peel-ply to bubble. This is usually not a problem, but any time a large amount of epoxy is curing it should be watched closely. We removed the peel-ply once the epoxy was fully cured. How long this takes depends on the ambient temperature and what hardener you used. Obviously, we always use a slow hardener in the tropics. After waiting for the last layer of epoxy to cure, we washed our patches with freshwater to remove any amines (a waxy by-product of the curing process), which can prevent primer and paint from adhering correctly. Next we washed the patches in acetone, then primed and painted the bottom. When we were done, the patches had completely disappeared, along with the three through-hull holes we didn’t need anymore.